1861, 10¢ dark green, First Design, Lambertville, N.J. town cancel, intensely rich color and beautifully centered, Extremely Fine, an extremely difficult stamp this well centered; with 2015 P.F. certificate. 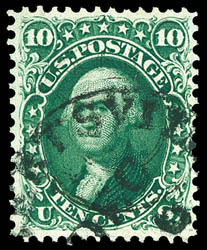 A CHOICE USED EXAMPLE OF THE 1861 10¢ FIRST DESIGN ISSUE.